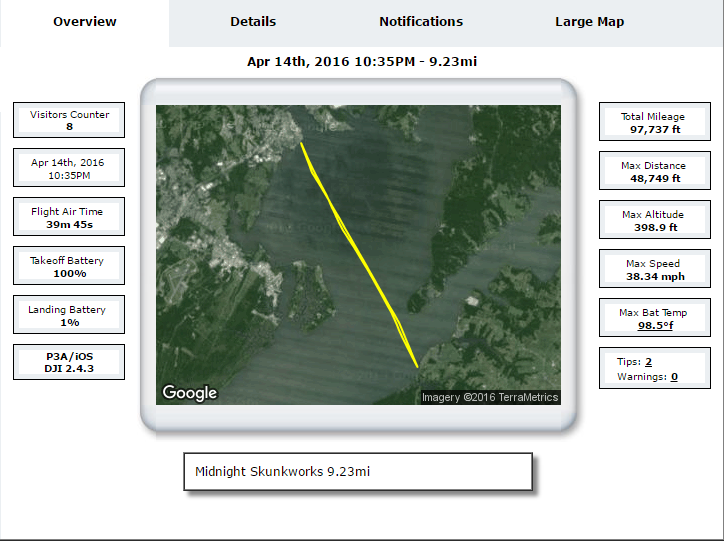 9.23mi 40min Flight - Midnight Skunk Works! Took the SOLID P3A out to 9.23 miles tonight. A direct result of the collaboration of some of the brightest, most innovative and "balls-of-steel members" (you know who you are), "Midnight Skunk Works" has achieved a major accomplishment in less than perfect conditions. This could go 10mi+ in ideal conditions. This can't be stock ? Wow, Amazing landed with 1% percent battery. Ed, with what auxiliary battery? Ed, what brand shirt were u wearing!! Never mind that, what brand of underwear were you wearing! According to healthy drones you had 30 seconds worth of flight time left. My guess is the underwear is steel lined and belted to hold up all that brass! P3A using a Multistar 5200 battery and FPVLRv2. I flew out into the wind which was not too bad at first but picked up as I got out there. I could have gotten way further if I wasn't pushing against such a head wind. I was wearing a Lucky Brand t-shirt, with an Old Navy thermal on top. Underwear were Hanes boxer briefs http://www.amazon.com/Hanes-Ultimate-Comfort-Waistband-Boxer/dp/B00ACIGVJ4/ref=sr_1_2?s=apparel&ie=UTF8&qid=1460727977&sr=1-2&nodeID=1045706&keywords=hanes+boxer+briefs . Do you have a "Build Thread" that details what you did to prepare for this flight? What fw are you using ? Fpvlr boosted or not boosted ? No build thread just knowing your equipment and being able to read environmental factors. Could you write the setup of your fpv long range Phantom? Did you also install an auto antenna tracking? This is actually what I'm looking for, but the more I search how to plug the AAT-transmitter to the main board the less I find..
A direct result of the collaboration of some of the brightest, most innovative and "balls-of-steel members" (you know who you are), "Midnight Skunk Works" has achieved a major accomplishment in less than perfect conditions. Super cool! Innovation, "balls of steel", collaboration and 1.1.9 to boot! Many of the things that have become extinct in the new world order. You guys have "earned" the title of "Midnight Skunk Works"! How do I sign up? Congratulations!